NetWorx is a simple and free, yet powerful tool that helps you objectively evaluate your bandwidth situation. 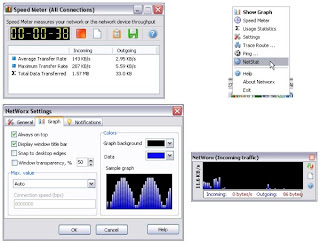 You can use it to collect bandwidth usage data and measure the speed of your Internet or any other network connection. NetWorx can help you identify possible sources of network problems, ensure that you do not exceed the bandwidth limits specified by your ISP, or track down suspicious network activity characteristic of Trojan horses and hacker attacks. The program allows you to monitor all your network connections or a specific network connection (such as Ethernet or PPP) only. The software also features a system of highly customizable visual and sound alerts. You can set it up to alert you when the network connection is down or when some suspicious activity, such as unusually heavy data flow, occurs. It can also automatically disconnect all dialup connections and shut down the system. The incoming and outgoing traffic is represented on a line chart and logged to a file, so that you can always view statistics about your daily, weekly and monthly bandwidth usage and dialup duration. The reports can be exported to a variety of formats, such as HTML, MS Word and Excel, for further analysis. Usage reports with export to a variety of file formats, including Excel, MS Word and HTML. Permits close supervision of uploads and downloads. Works with dial-up, ISDN, cable modems, ADSL, Ethernet cards, and more. Includes network information & testing tools with advanced netstat that displays applications using your Internet connection. Scalable to your own modem download capabilities. Option to notify user or disconnect from the Internet automatically when network activity exceeds a certain level. Absolutely free and does not contain any adware/spyware/malware. Fixed zero-length duration records that could sometimes be written to dial-up log. Added unit selector (bytes/s or bits/s). Added gradient to the graph.